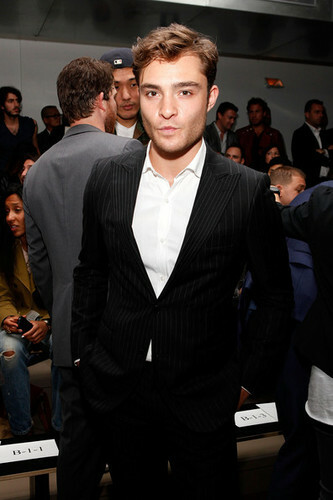 Ed Westwick attends the Simon Spurr Spring 2012 fashion ipakita. Ed Westwick attends the Simon Spurr Spring 2012 fashion ipakita. Wallpaper and background images in the Ed Westwick club tagged: ed westwick ed westwick 2011 fashion show sebastian stan event. This Ed Westwick photo contains business suit, suit, suit ng mga damit, and tatlong piraso suit. There might also be double breasted suit and single breasted suit.